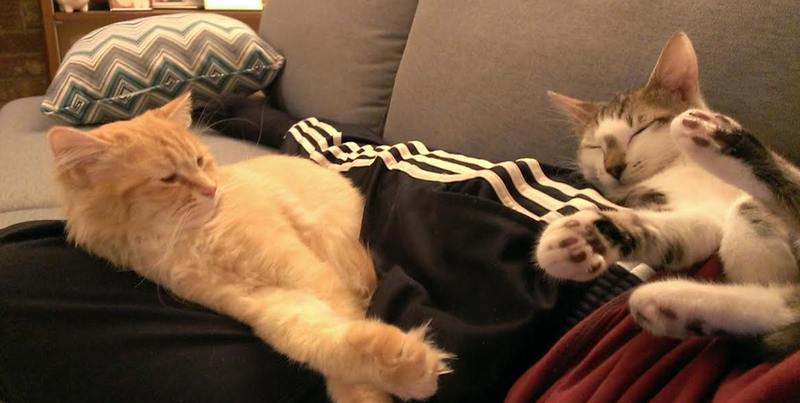 As you know, a couple of months ago we got a new cat – Esmerelda. She’s a little kitten who is friendly and affectionate… and always hungry. She says “I’M SO HUNGRY!” all the time. This wouldn’t be a big problem except that we have another cat Ruby. Ruby is a couple of years older and used to have the same hunger problem Esmerelda has, but not anyone. Nowadays, Ruby budgets her food to last throughout the day while Esmerelda (aka Zelda) wolfs it all down whenever we feed her. The two cats get different food; Zelda gets kitten food while Ruby gets a combination of 3 different types of adult cat food. If we were to feed them side-by-side, Zelda would gulp down all of her food, while Ruby would eat a little bit, saving the rest for later. However, once Ruby leaves, Zelda would then head over to Ruby’s dish and start eating that too. This leaves too little for Ruby but worse, results in Zelda eating too much. To remedy that temporarily, we put Ruby’s food dish up on a table that Zelda can’t (?) get to, but Ruby can. At least, we think Zelda can’t get there, I’m sure she could if she tried. We started feeding Ruby there but it is at best a temporary solution. The fix for this was to get Ruby a high-tech cat feeder. 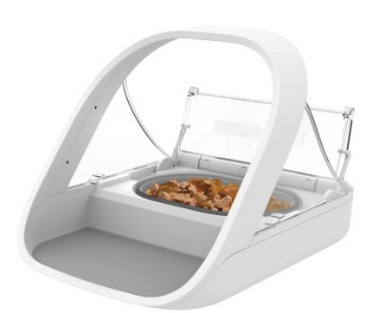 This is a feeding dish that opens and closes automatically. It pairs with the cat’s microchip and when the cat is close enough to the detector, the dish opens automatically after a 3-second delay. When the cat walks away, the dish closes. It took Ruby a long time to figure out how to use it. First of all, I had to pair it to her microchip and to do that, you put it in detection mode and put the cat near it. Ruby STRUGGLED FIERCELY while I did it, fighting against me as I held her head in there while it put her microchip in memory. Then, for the next two weeks, we had to leave it on the table open all the time so she would learn to use it. Because at first she couldn’t figure it out. But now she has figured it out. When she wants her food, she goes up to it and it opens, and she munches on it. She walks away and it closes. After a week, I finally put it on the floor where it will stay. The only “problem” is that Zelda knows there is food in there too, so she tries to get into it when it is closed. She tries super hard. She doesn’t succeed, but she knows that is food. Problem 2 is how to feed Zelda. Right now, we feed her about 1/4 cup (or slightly less) of kibbles 4 times per day. That’s a lot; it means that if we ever go away for a weekend, we have to get a pet sitter to come in and feed her. We can fill up Ruby’s dish just fine, but we can’t trust Zelda because she might overeat. Ruby, of course, had the same problem as a kitten. This device is also high tech, maybe even more than Ruby’s feeder. This one releases food at a timed interval. However, you program it with your smartphone. To do that, we ordered it and it arrived in three days (the other one took a month). 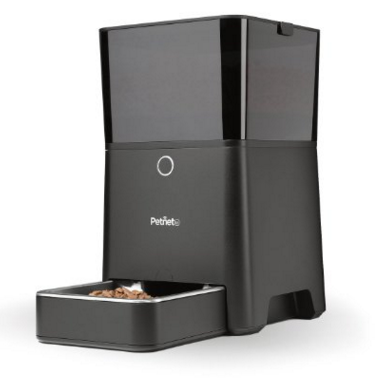 I set it up, and then first you install the Petnet app on your phone, and then enter in your wifi network and password, and then you connect the pet feeder to your smartphone app. Next, you program in when you want to have your pet fed, so I did it 4x per day for Zelda. But the advantage of this device is that people on the Internet complain that pet feeders jam. 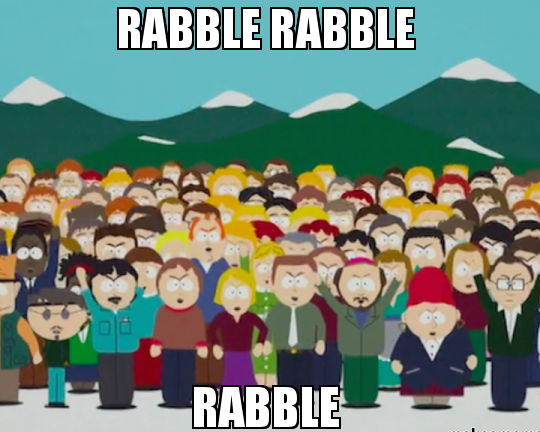 If we’re away, that’s bad. What this one does is it tells you if the latest pet feed was successful, and more importantly, if it jams. This is important to keep tabs on whether or not Zelda is getting fed. I can check the app to see the latest feeding schedule, and I can also make adjustments to it. I can also do manual feedings – both by pressing the button on the front and I think through the app, too. Furthermore, the app is smarter than that. You can fill out the size of the pet food bag, how much you feed our cat, and what type of cat food you are using. There is then an option for the pet feeder to automatically re-order cat food when you are getting low. To me, this is an incredible option. I’ve wanted to automate the acquisition of supplies for a long time. I haven’t used this technology yet, but if this Internet-of-Things actually works, then I can see how it would be expanded to other things, too (e.g., reordering food). 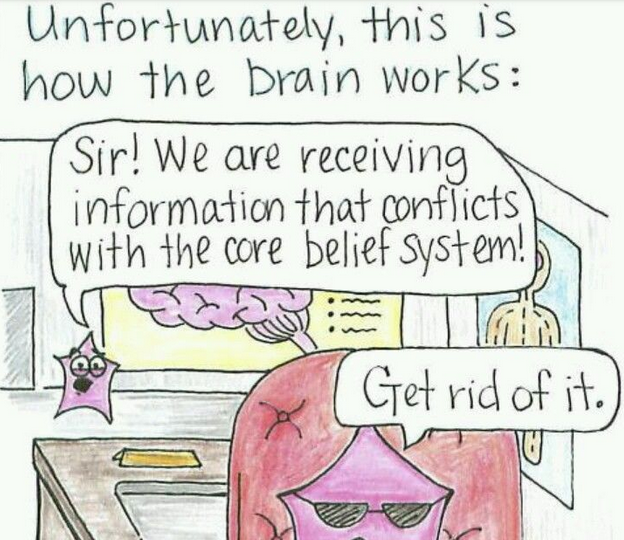 So that’s how we use technology to solve a couple of problems we were having. Rounding up the origin of my family’s history is my mother’s mother’s side (my maternal grandmother, the last of my grandparents to pass away in 2012). This is the side for which I have the most documentation (or second most) but is also one of the most confusing to research due to there being multiple places by the same name in the country of origin. My maternal grandmother was born in Poland in 1920 in a town called Wladyslawow (pronounced Vlad-ih-slav-ov). If you do a search on the web for that town, there are over 25 places on Wikipedia that it could refer to and they are all over the map. Furthermore, if you go to Bing Maps and type in “Wladyslawow”, the first hit that comes up is Wladyslawowo which is not necessarily the same place. So to figure it out, I looked up where my grandmother’s first husband was born, and that’s in Adamow, Poland. I then looked up where they were married and that is in Chylin, Poland. Adamow is 5 miles from Chylin, and Chylin is 2 miles from the closest Wladysawow. The marriage certificate for the two of them lists their occupation as “bauer” and if that were a last name, it would mean “peasant.” I take this to mean that they were both probably working class people who wouldn’t have been able to move around that much, which would have been normal at the time. I’ve included Kalisz on the map which is where another side of my family comes from, it is 35 miles away from the likely location of my grandparents. Let’s zoom in a bit and see the distance involved. Notice that there’s a place (district?) called Kamionka which is the same name as where my maternal grandfather was born. Is this the actual Kamionka and not the one from my other blog post? Who knows. Now, I’ve said all of this is Poland, but remember that the borders of Poland shifted after World War I. 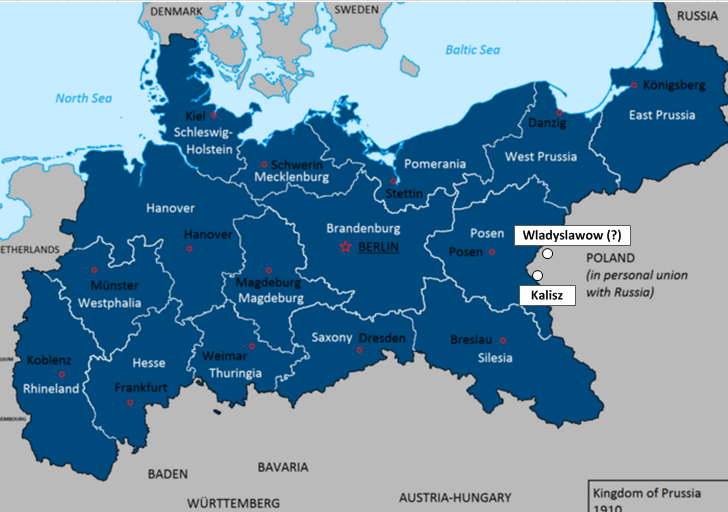 Because Kalisz is a border region that was definitely part of Russia before the first World War (but Prussia before 1795), and because these towns above are so close to Kalisz, here’s a pre-World War I map where I estimate where these places were in regards to Prussian territory. You can see I’ve put it near the border but that’s a guess. 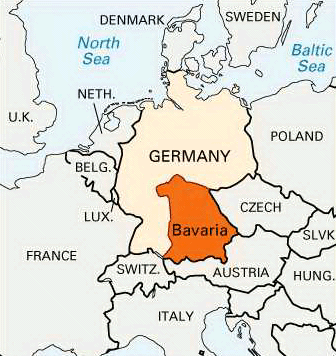 Its proximity to border likely accounts for the family’s German heritage. In either case, after World War I it was definitely Poland and that’s where my grandmother was born. My maternal grandmother, and her parents, each spoke German (and Polish) so that would explain a lot if they were indeed living in Prussia before World War I (as in, her family was living in Prussia, and her first husband was born there; and after the war the family didn’t move but the borders did, but the culture and language similarly remained). English, French, German, Dutch, Spanish (Simón), Czech and Slovak (Šimon), Slovenian, Hungarian, and Jewish (Ashkenazic): from the personal name, Hebrew Shim‘on, which is probably derived from the verb sham‘a ‘to hearken’…. In the Greek New Testament, however, the name occurs as Simon, as a result of assimilation to the pre-existing Greek byname Simon (from simos ‘snub-nosed’). Both Simon and Simeon were in use as personal names in western Europe from the Middle Ages onward. This is the fifth last name in my family history where I have one that is of German + Jewish origin. That’s the sixth last name in my family history that is of German + Jewish origin. Anyhow, coming back to geography, the above is the most likely origin of my family, that they were living in Prussia which of course was part of Germany at the time. It then became part of Poland after World War I, and then became part of Germany again right before and during World War II, and then became part of an independent Poland again after World War II. While the borders today make it look like it is close to the middle of the country, it wasn’t always that way. 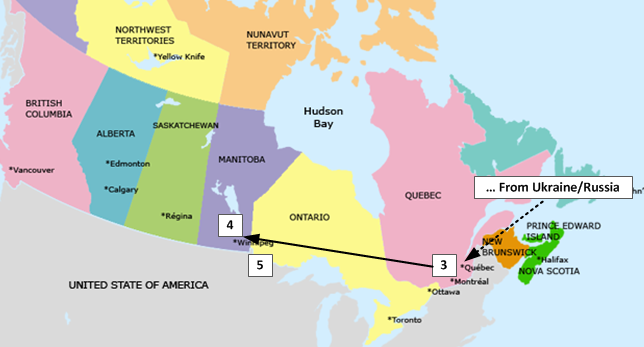 This side of my family’s history of coming to Canada is crazy, so I better tell it so it can live on in cyberspace. My family’s ancestors were living in Germany (the Prussian part, which then became Poland) in the 1920’s when my great grandfather Hinz (who married the Simon) came to Canada. He went ahead of time to get things ready to prepare to bring the rest of the family over. This forced him to have to wait until the economy could recover so he could afford to bring the rest of the family over – his wife and children. My grandmother would have been 9 at the time, and my great-grandmother would have been 39. Since they were peasants (or farmers) they would have needed to save up for a long time in order to afford to bring over the rest of my family. The Great Depression lasted a few years but eventually it began to lift. Then another massive disaster struck – World War II. At that poit my great grandfather definitely couldn’t bring anyone over. My grandmother got married in 1940 and as I said before, they were living in Germany. Her first husband was called up to the military (he had no choice) but he died during the war. Doing the math I think it was nearer to the end of the war. My grandmother became a war widow with two small children under the age of five – my aunt and her younger brother whom I never met. I never met him because when it became clear that Germany was losing the war, the population had to get up and move further west to escape the wrath of the Russians for were coming from the east. My great grandmother managed to make it back further west to Germany but my grandmother did not. She was deported to fricking Siberia for three years as part of their “Guest Worker Program.” Of course, the workers were anything but guests. But unfortunately, along the way, my grandmother’s young son died. My grandmother and aunt spent 3 years in a work camp in Siberia before they finally returned to Germany. 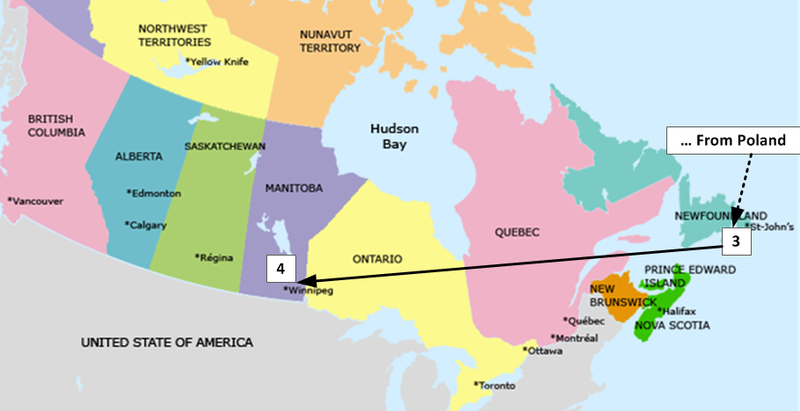 My great grandmother emigrated to Canada in 1948, and my grandmother plus aunt emigrated in 1949, finally arriving in Canada in July of that same year. She became a Canadian citizen but I am not sure when because the date is not on the naturalization certificate, but also acquired a German passport in 1967. So I guess she was a dual citizen? I know that when she came to Canada she was given a temporary travel document in lieu of a passport for a stateless person. My grandmother came straight to Winnipeg where she met my grandfather (also from Poland) where they got married the next year. And with that, it wraps up my family history. You can see I have a lot of roots in Germany going back several generations, but the most recent ones are in countries other than Germany – notably Poland and Russia. I also was surprised to discover just how many last names in my history are of Jewish descent. In a future blog post, I’ll get into why my ancestors may have left Germany. In the case of my grandmother, it’s obvious: the family was tired of all the war. For my other relatives it’s less clear. I’ve investigated some major population trends that tries to explain why the Germans left to go to Russia, and how they retained their culture. 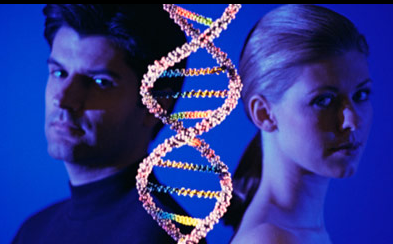 The next step on my family history is my mother’s father’s side. This is the side in which I have the least information going back more than one generation. My grandfather had a Polish passport and for all intents and purposes, he was a Polish citizen. I don’t know that much about him – my other relatives can fill in the gaps although I think that they don’t know much about him either, for whatever reason – but I know that his mother (my maternal great-grandmother) had the last name Schulz, which is a variant of Schultz (I won’t give his actual last name because your mother’s maiden name is often used as a security question but I will say it’s not Jewish). German: status name for a village headman, from a contracted form of Middle High German schultheize. The term originally denoted a man responsible for collecting dues and paying them to the lord of the manor; it is a compound of sculd(a) ‘debt’, ‘due’ + a derivative of heiz(z)an ‘to command’. The surname is also established in Scandinavia. Jewish (Ashkenazic): from German Schulze (see 1 above). The reason for adoption are uncertain, but may perhaps have referred to a rabbi, seen as the head of a Jewish community, or to a trustee of a synagogue. In case you’re not keeping track, this is the fourth last name in my family lineage that has a last name of Jewish (and German) origin. My grandfather’s actual last name is also of German descent. He also spoke German, and apparently he also spoke Polish. Poland is a difficult country to research. 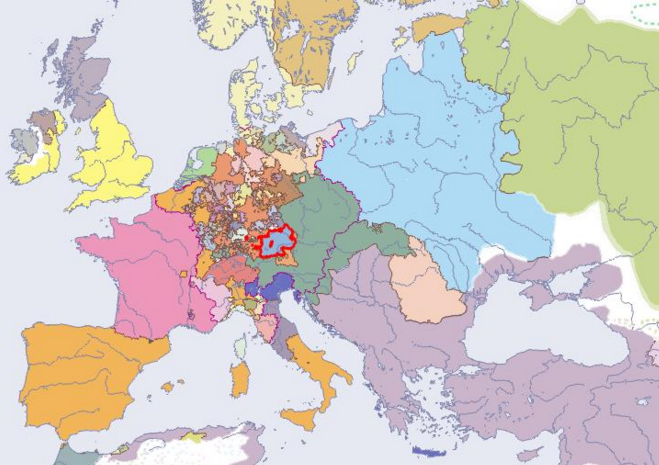 It was invaded and sliced up by its neighbors Austria, Prussia, and Russia in 1795. 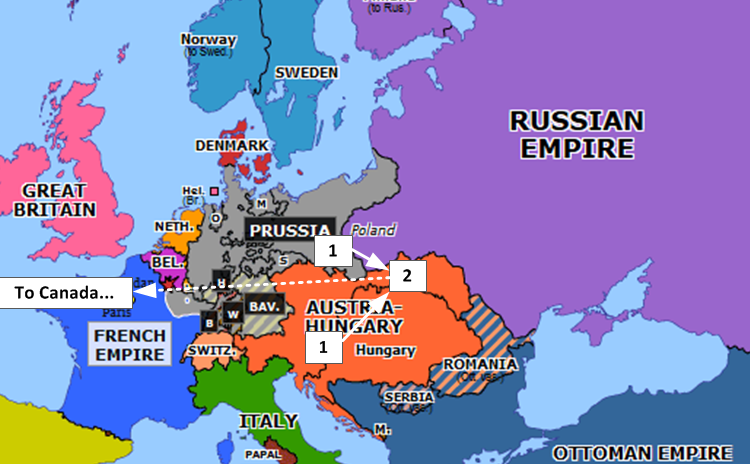 It was given limited autonomy when Napoleon’s armies bulldozed across Europe in the early 1800’s, and then was divided up again between Prussia, Austria, and mostly Russia after the Congress of Vienna in 1815. It stayed that way until after World War I (with Russia’s rulers getting more power during that time in the Russian side). After World War I, Poland was repatriated back to itself when Russia collapsed and the Germans lost the war. 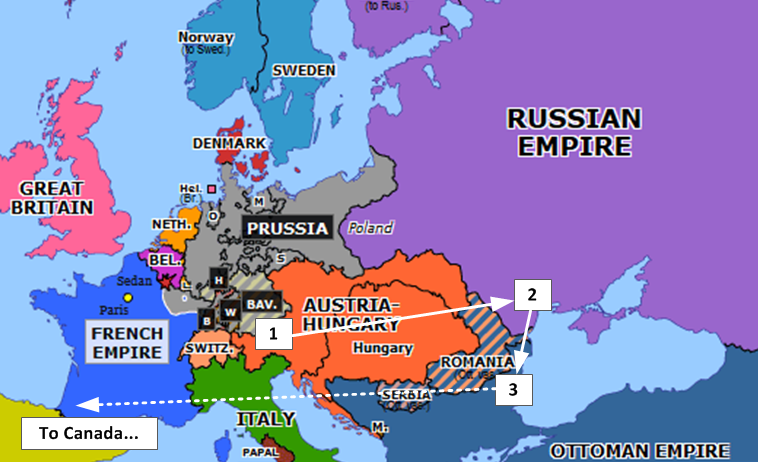 Poland, however, fought a brief war with Ukraine for some disputed regions, and borders again shifted. They would shift yet again after World War II, north and west. I say all this because my maternal grandfather was born in Kamionka according to his Polish passport. 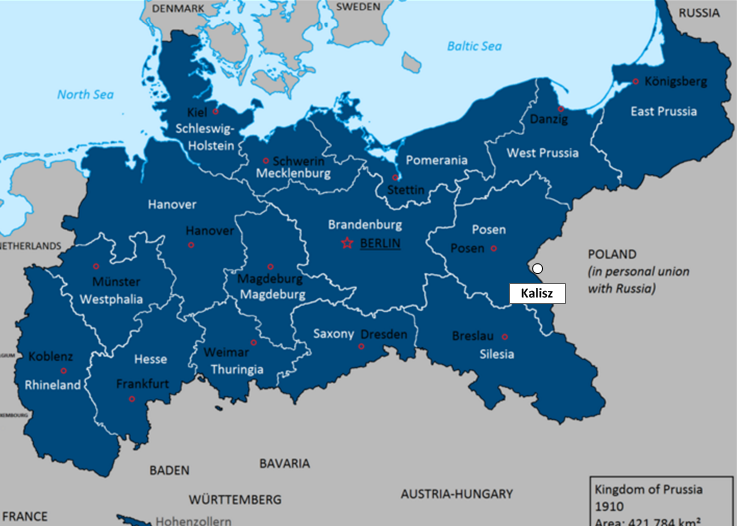 This is not all that helpful because there are lots of possible places this could be, there are many towns, districts, and counties called Kamionka in both Poland, the Ukraine, and even Austria. The one thing I am sure of is this – my grandfather was born in a region that shifted borders that eventually became Poland, but the country he was born in would have been either Russia or Austria. He was baptized in the district of Rovno in the province of Volynia in what is now the modern day Ukraine, in the town of Tuczyn. There aren’t any towns called Kamionka around there. However, I did find a town called Kamionka near modern-day Lviv (formerly Lwow) which at the time he was born would have been in the Austrian empire. The problem with this is that he was baptized about a week after he was born, and those two places are 140 miles apart. I have a hard time believing my great-grandparents travelled that distance in 8 days just to get him baptized. 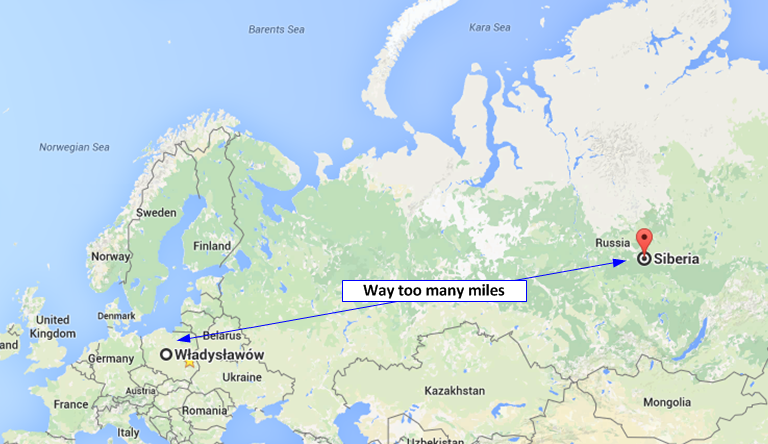 Below is a map of modern-day Europe showing the distance, you can see that the towns are both in Ukraine. However, here is what the region looked like in 1920. You can see that both are (were) in Poland. And before 1920, the town of Kamionka was located in Galicia, a region of the Austrian empire shaded in purple. 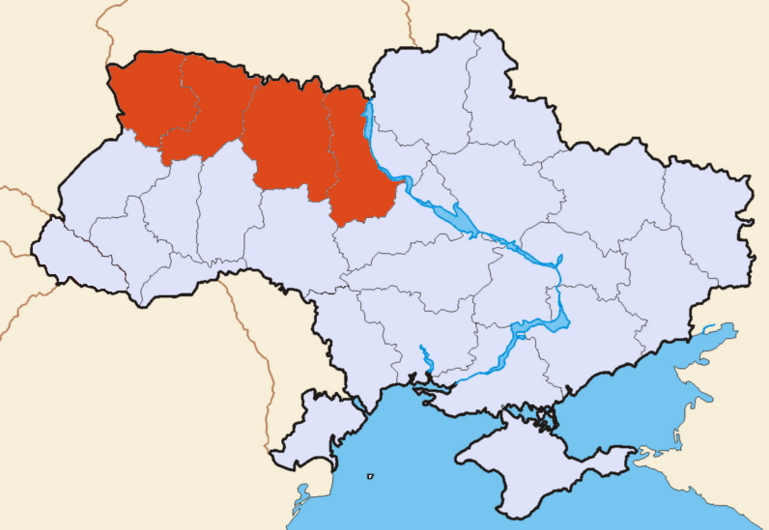 I’m not sure what the blue region is as Wikipedia didn’t translate but I think it is Volynia, the border region that kept changing hands and in all likelihood was part of Russia. Of course, all of this hinges on the guess that Kamionka above refers to this town I found and not to some other one. As I said, it is a large gap between those two towns and it seems unlikely that in 1908, my great-grandparents would have gone all that way. Anyhow, all that to say that my grandfather has a Polish passport, was born in a region where the borders changed, and in 1929 he left the city of Danzig (now known as Gdansk) and came to Canada where he landed in St. John’s, Newfoundland. We don’t have a lot of data on where he went after that, there’s a big gap in knowledge. The first definitive location I have for him is in Winnipeg in 1944. He later married my grandmother in 1950, and my mother was born the next year. My grandfather was 21 when he came to Canada. We don’t know why he left, but that region of the world was afflicted by war in World War I, and right after that when Poland fought a war with the Ukraine, and then a war with the Soviets in 1920-1921, and a couple of other uprisings in the 1920’s. My guess is that he probably just wanted a better life overseas, away from an unstable region. So once again, this side of my family starts in Germany by the origins of the their last name, but if my research above is accurate then at some point they moved to Poland. I don’t know when this occurred but I have some guesses which I will get to in a future post.